Bali is a 1995 TB Gelding standing 16.1 hands tall. He was purchased in the spring of 2004 to be used in the THF school program. He has learned to trust people and has become a great addition to the program. He has a very bouncy trot and a rocking horse canter. Bali has some energy and is easy to go forward. 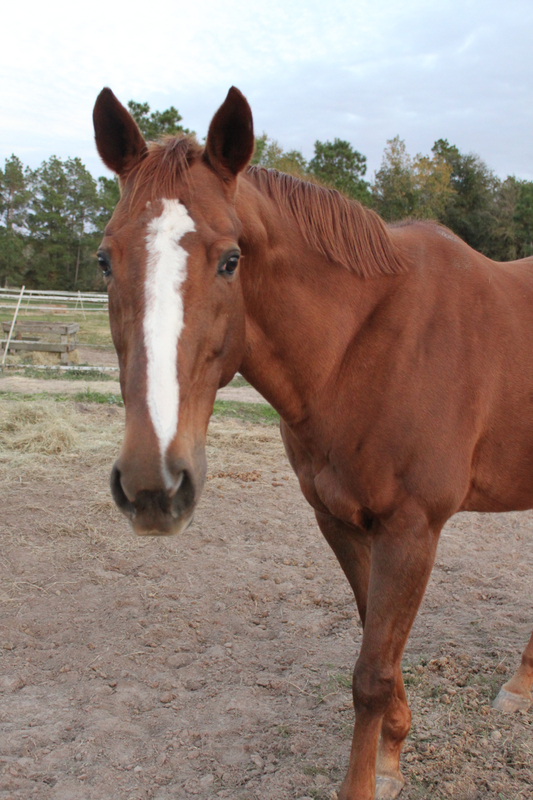 He has been one of the most requested horses to lease over the years. Bentley came to the farm as a project horse for Mrs. Sheridan and after working with him some we decided to use him in the lesson program. He is a 16.1 hand TB and was born in 2001. He has now been in the program for years and we just love him. Bentley has one of the more challenging trots and jumps. He is very bouncy and will test your leg position. He does have a fantastic canter and is very sweet! Diablo belongs to Mrs. Ashley and has been living here at THF for many years. 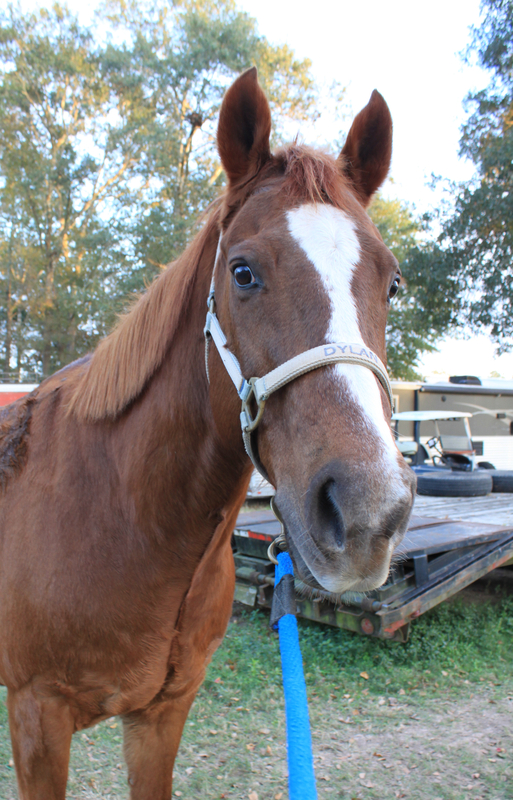 He is a 2002 15.3 hand quarter horse. Diablo loves his job as a school horse and we feel very lucky to have him in our program. Diablo has a flat easy to sit trot and a smooth canter. He does like his riders to be balanced on his back or he will show you how he can do lead changes. Diablo is wonderful for students to start learning how to jump because he is so happy to trot the jumps. This builds confidence and a great foundation. 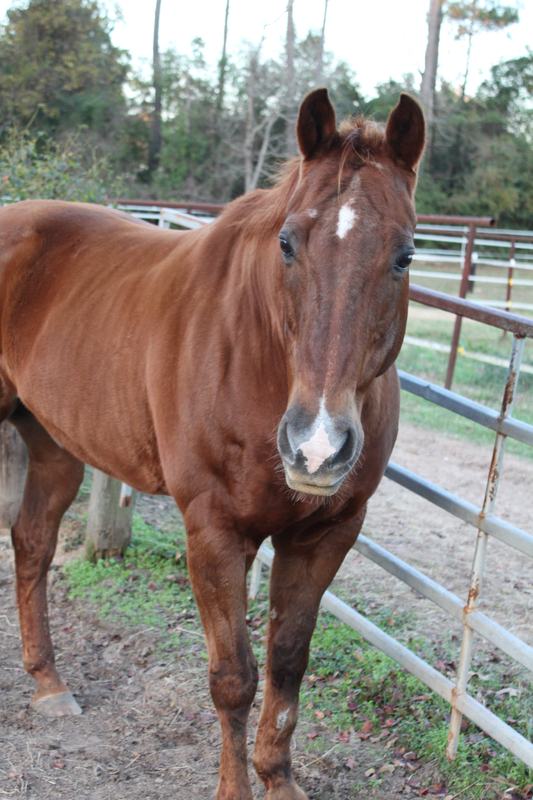 Dylan is a 1997 Quarter horse and is 16 hands. He loves to jump and is one of the favorite school horses for many of the students. He is still jumping over 3’6” fences and will do his lead changes for anyone. He is easy enough for a beginner rider to enjoy but exciting enough for the advanced riders as well. Dylan has gone to many shows competing in equitation classes and jumper classes. Dream is a 2002 Oldenburg mare standing 16.1 hands. Dream has a trot and canter that are as smooth as glass. She is a challenge to ride because she is slow to move off your leg. But once you start to jump she is having fun and is willing to go better. She was injured recently and is a little slow to warm up now but it has not affected her love for jumping. Dream has competed in show all over the country winning many ribbons and several year-end championships on the GHHJA circuit. Espirit is a 15.1 hand 2001 Thoroughbred. She has a trot that feels like you are floating on clouds and a dream of a canter. She came to THF straight off the track and when you ride her you know why she didn’t make it as a race horse. Espirit is gentle, kind and a little slow. She is very willing to please and loves to jump. Since her time at THF she has been to many shows and has won the students lots of ribbons. Hooter is one of the older gentlemen on the farm with a birthdate of 1987. He is a Quarter Horse and stands 16 hands proud. Hooter was first purchased by a student when he was 3 years old and has been part of the family since. He has gone to local shows and “AA” shows for much of his life and won more ribbons than we can count. But now days his days are a little slower and he is happy to stay home and teach beginners. Espresso is a black 16.2 hand Holsteiner born in 1992. 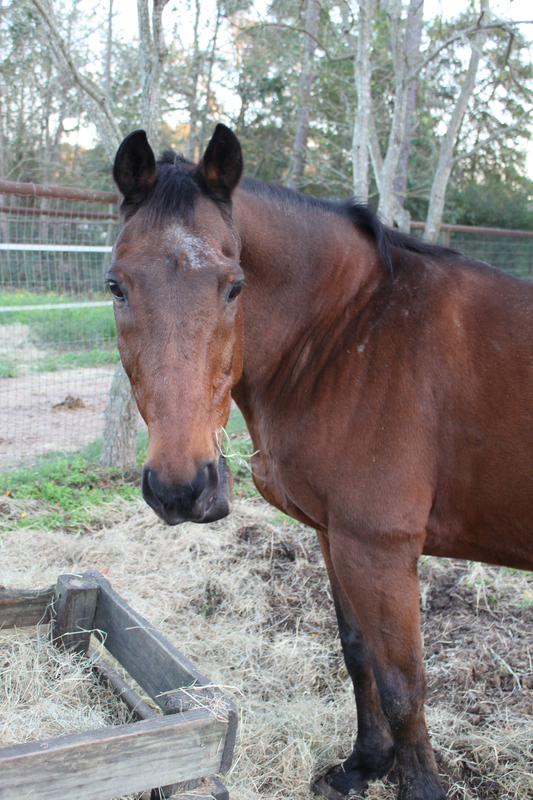 He came to THF when his family was no longer riding and wanted him to have a place that would love and care for him. He has been an amazing asset to the school program and although he doesn’t jump 1.30m jumps any longer he has a wonder jump and a beautiful lead change. He has one of the best canters of all the horses. He does however have some arthritis in his hocks and takes a little maintenance and warm up to get going. 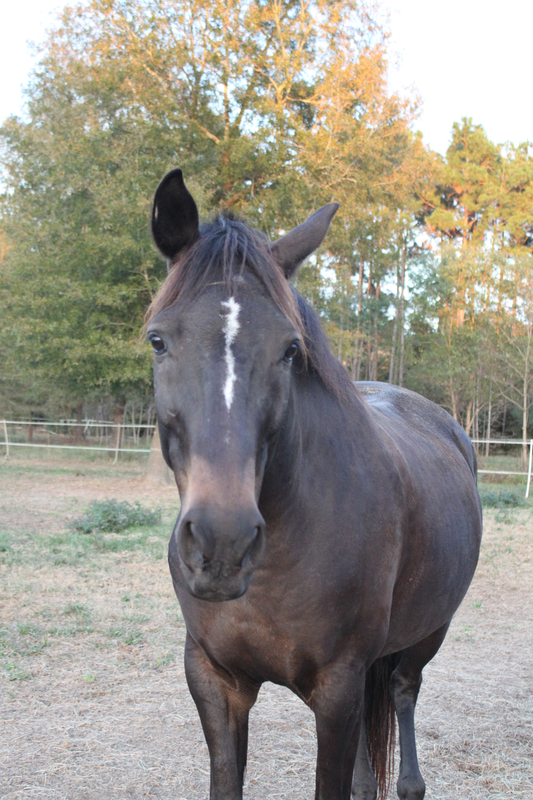 Fancy is a feisty Thoroughbred mare born in 1995 and she is 16 hands tall. Fancy has been around for many years and is the mother of Whinny, Pride and Fancy Pants. Once she was finished having foals she began her riding and showing career. She has competed in “A” shows like Pin Oak in the Children’s Jumpers and won many ribbons. She is a fast ride and very sensitive. She will make your heart beat with excitement when you ride her. Frankie is a 1996 Hannoverian and is 16.2 hands tall. He is the gentleman of all horses. He carries himself around like he is wearing a suit and tie. He has the most comfortable canter of all the horses and when you ride him it is like sitting on a couch. He competed as a Jr Hunter in his day and still jumps around 3’ like there is nothing to it. His trot is smooth but springy. Frankie can sometimes be a little difficult to catch in the field so you better bring a treat. Hermes was brought to THF as a rescue and a project for one of Kim’s students. He is a TB born in 2007 and is very tall at 16.3 hands. Hermes show name is “Daddy Long Legs” and it fits him perfectly. His legs go on for miles and because of that he is very tall. When you ride him he is very long bodied horse too and you must sit tall to keep him in a frame. Hermes loves to show and has won in the hunter, equitation and jumper arena. He is an athletic horse despite his long legs and can jump very high. 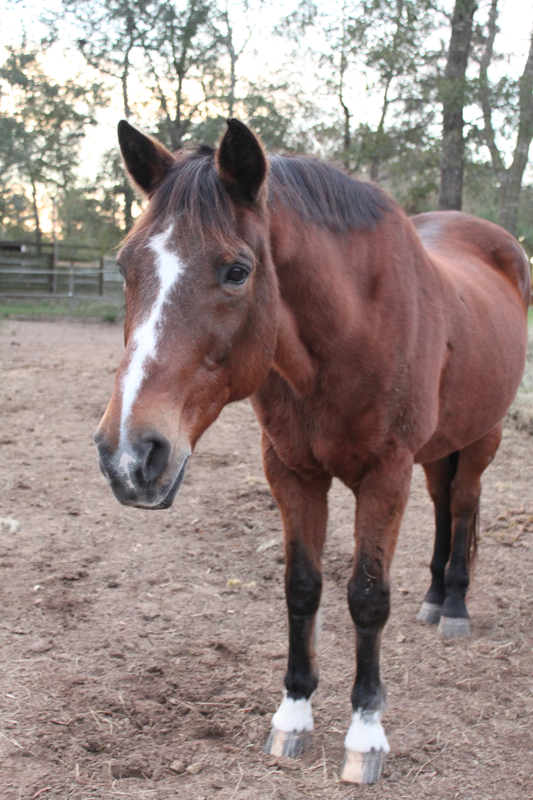 Hannah is a 1995 Quarter Horse who is 16 hands tall. She came to THF for one of Mrs. Kim’s students and when the student needed to move on to a horse to do jumpers, she became a school horse. Hannah has choppy gate when you ride her but is very pretty to watch. She jumps amazing and her knees are in perfect form. She also goes to lots of shows and has won more that we can list. Jackson is a 1992 15.2 hand thoroughbred who spent the first part of his life as an eventer and he is very confident over the jumps. He loves to carry the rider around the courses and will make all the students look like a professional. He has both a trot and canter that are very easy and smooth and has lovely dressage work. He is small for his size but don’t think he is going to do the pony strides! Jackson has a very large stride. He loves to go to the shows and is a favorite when we take the students to school cross country. Jenny is a 1997 TB mare. 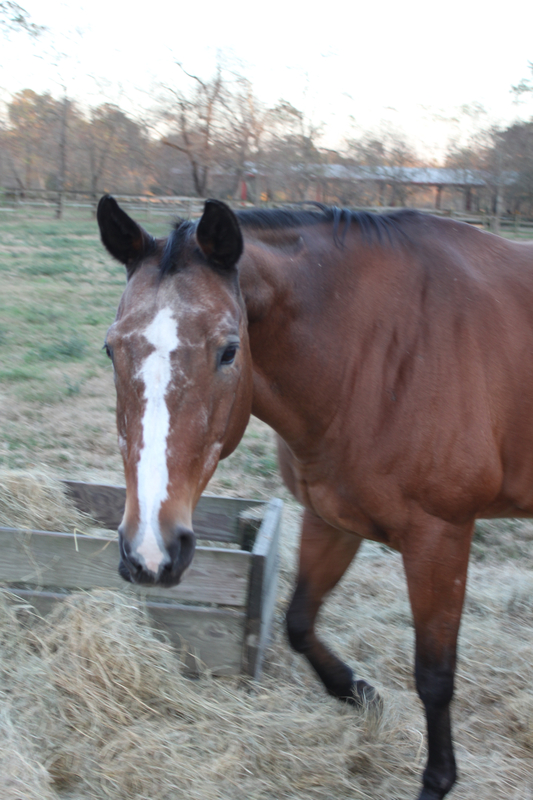 She is 15.3 hands tall and came to THF in 2007 from Fair Weather Farm in Maryland where she was a school horse. Jenny doesn’t like to be left in the cross ties and will move around a lot when left tied, however when she gets to the arena she is in her element and knows what to do. She is easy off the leg and loves to jump. Jenny has gone to many schooling shows and loves to win ribbons. 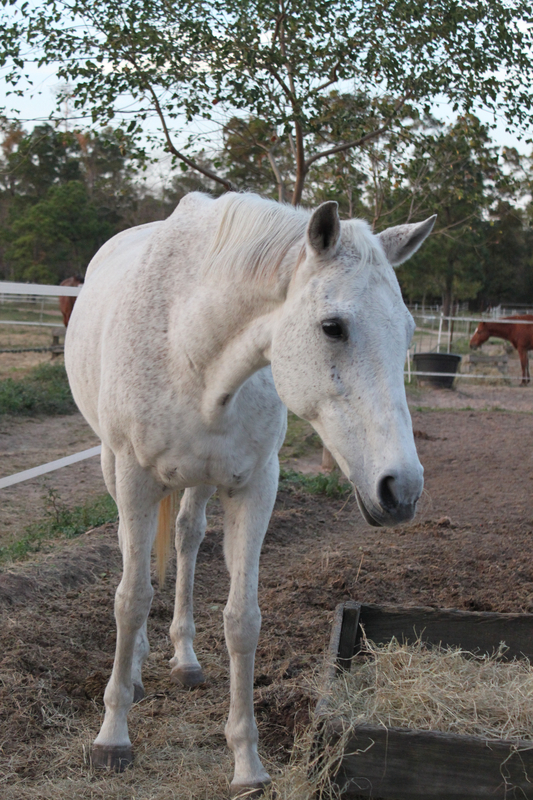 Leo is a 1992 grey 16.2 hand thoroughbred. He doesn’t seem to know his age so we are keeping it a secret. He absolutely loves to jump and is fantastic in the jumper arena. He can make very sharp turns and is always in the top of his class. Leo has traveled all over the country winning ribbons and being very fast in the arena. He has many year-end Championships to his credit. He has a narrow body and is a sensitive ride. Leo doesn’t much care for the cross ties so we tie him in his stall to saddle. Macho is a 1988 Quarter Horse and is 15.1 hands tall. He is one of Mrs. Kim’s favorite trail horses. He loves going out and has seen everything. He is a great beginner horses with smooth gates and a calm personality. He enjoys his work at the ground poles and is very good at jumping. He has a round jump and more active canter which is a nice change from the lazy lesson horse. 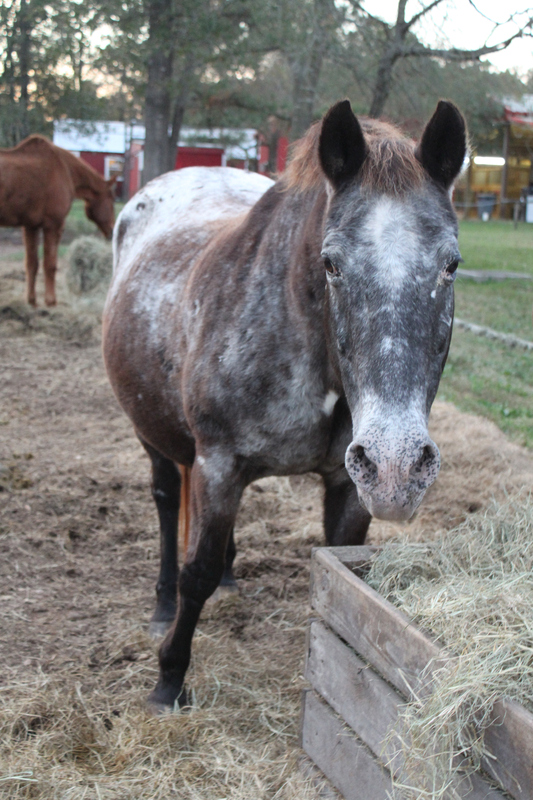 Magic is an appaloosa born in 1991 and she is 15 hands tall. She is all the little girl’s favorite horse. She is very easy and is happy to help all the riders learn to ride. Magic is easy to make go, smooth in her gaits and stays on the rail very nicely. She is kind and sweet. Magic is another one that many students learn to how to canter for the first time on. Although we get asked all the time if she is pregnant Magic is not having any more babies. Magic is Diablo’s mother. Max was born in 1998 and stands 14.1 hands. He is a black and white pony that was purchased for one of Mrs. Kim’s students. Max was ridden by all the kids in the family and when they out grew him he became a school horse for THF. Max is a jumping machine. He just loves his job and has gone to many shows competing in equitation, hunters and jumper classes. Max has a bouncy trot and a big canter stride for a pony. Mercie is a 1998 American Warmblood and is 16.2 hands tall. He was purchased by accident. One day at a show, the owner was having trouble because Mercie doesn’t like to jump the water jump and Mrs. Kim said he just needed a new job and the owner said “what will you give for him?”. It was the best purchase ever and Mercie has been a wonder school horse. He can jump big courses and has gone to many more shows to compete in Equitation and Hunter classes. Mercie is a little slow and it takes some strong legs to ride him. 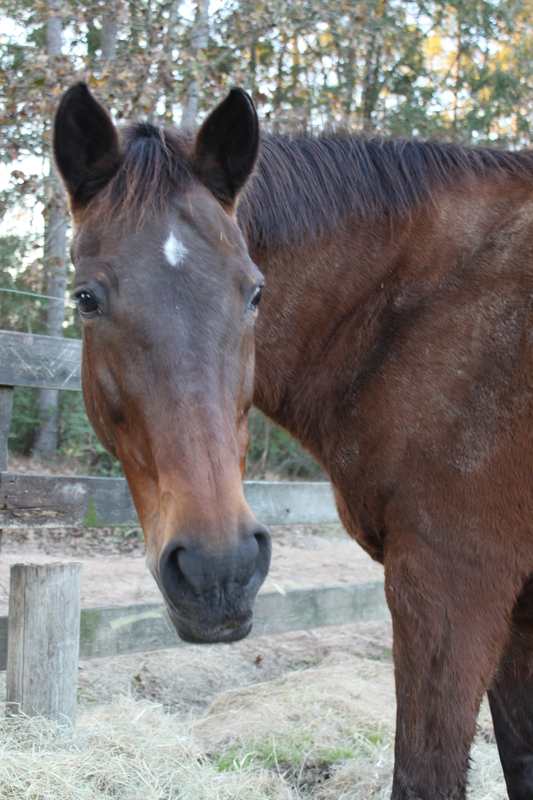 Mocha is a 1995 16.1 hand thoroughbred. She was also owned by a family at the barn and when they needed to move up to a different horse so Mrs. Kim got another good school horse. Mocha has competed in many shows from eventing, equitation, hunters and jumpers. She is a forward thinking horse in a good way and makes very nice turns in the jumper arena. She takes a rider with a calm leg and good upper body position. Molly was born in 2000 and is a very cute, easy pony to ride. She has been at THF for many years and started off with one of Mrs. Sheridan’s students. When she went up for sale the barn purchased her for a school pony and we are very lucky. Molly is smooth, easy to make go and loves to go to the shows. Molly went on the show circuit one summer and traveled to 5 different states competing. Molly can jump 3’ even though she looks small. 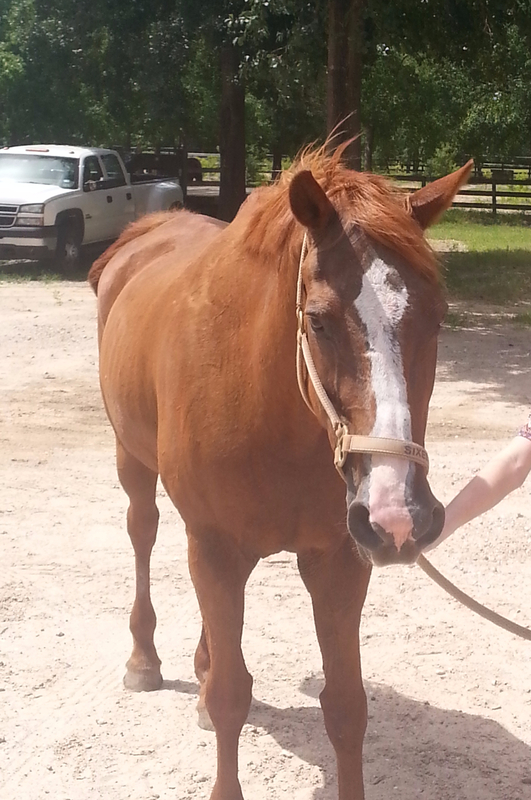 Money is a Quarter Horse Thoroughbred cross and is 16.2 hands tall. Money was born at THF in 2006. He was a surprise when we purchased his mother as a school horse and found out she was pregnant. Money started teaching the day he was born and was a project during summer clinic one year for all the students to help break him out to be ridden. He is now a seasoned professional and has done very well at “AA” competitions. He has a canter like glass and a perfect eye to the fence. 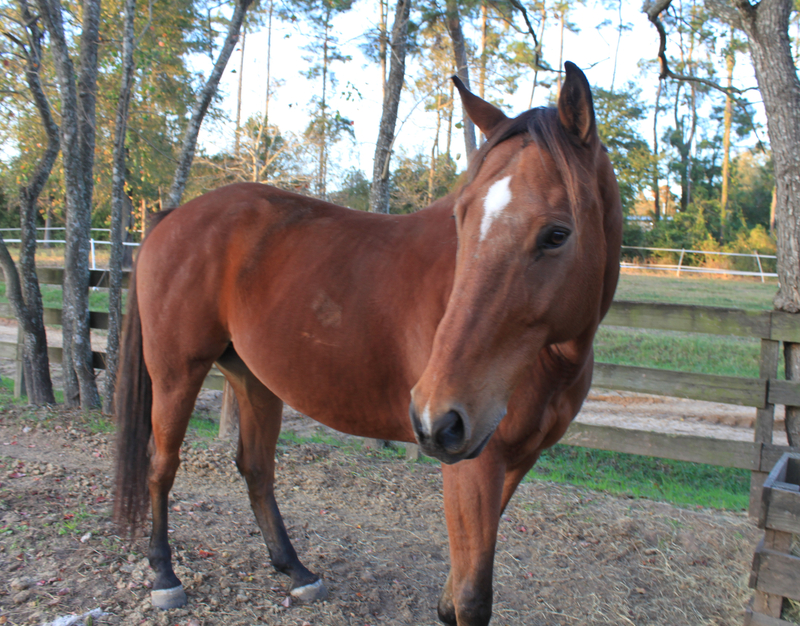 Peaches is a 14.2 hand Quarter Horse Pony and was born in 1999. Although Peaches has been in the barn for many years because she was Ms. Kyra’s first horse, she just became a school horse in 2016. She has taught many students how to be amazing riders so it only seemed right to have her join the school horse list. She has a great trot and smooth canter and she places very well in under saddle classes. Peaches has beautiful form over fences and places well in Pony Under-Saddle classes. 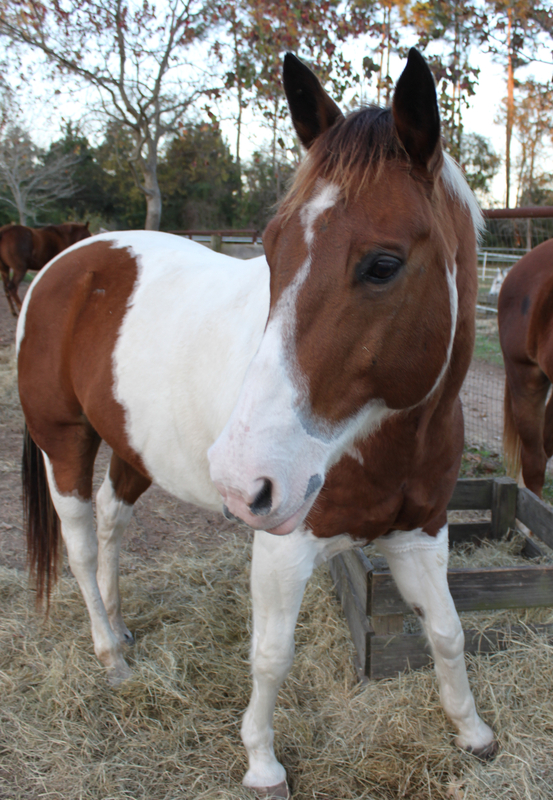 Pistol is a 2008 Quarter Horse and is 15.3 hands tall. Pistol joined THF in 2015 when Mrs. Kim purchased him as a project horse. He has learned to jump and how to change leads and is doing very well. We started to use him in the school program in 2016 for advanced students and he is also leased. Pistol loves to jump and is learning what all the people want him to do. He is going to make a great lesson horse. 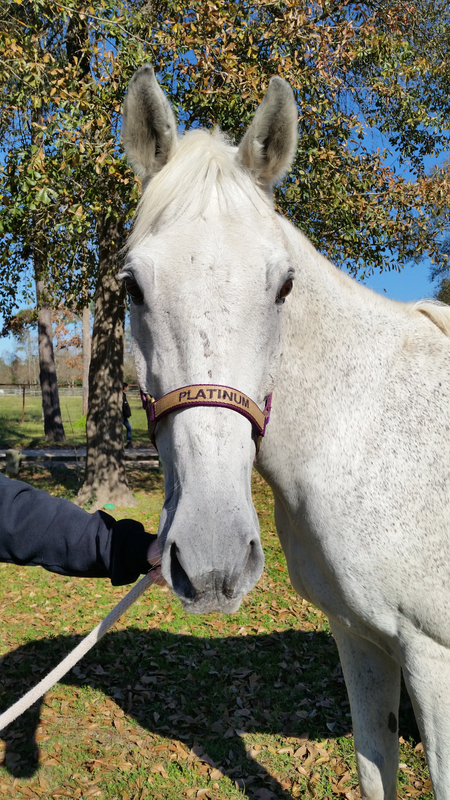 Platinum is a 2001 TB mare standing 16.1 hands tall. She also came from Fair Weather Farm in Maryland. She however was a project horse they had been working with and she has continued to do very well with us going to shows and being used for the more advanced students. Platinum has a beautiful canter and moves like a nice hunter horse. Pride was born at THF in 2004. He is an Irish Draft gelding standing 16.1 hands. Pride was started here on the farm with the help of Cheyenne and also has gone to many shows, both schooling and “A” shows. He loves to jump and is also good on cross country jumping. Pride can be a little strong and is usually ridden by the older students. If you have a chance to ride him he will teach you about having an outside rein. Remington is a 15.2 hand quarter horse born in 1990 that joined THF in 2016. He has been a school horse his whole life at Foxcroft and Kim helped to teach him to jump when she was working there. He absolutely loves to jump. He likes to have a balanced rider who does not pull on their reins. He is very quickly becoming a favorite in the barn by all the adults and the kids. 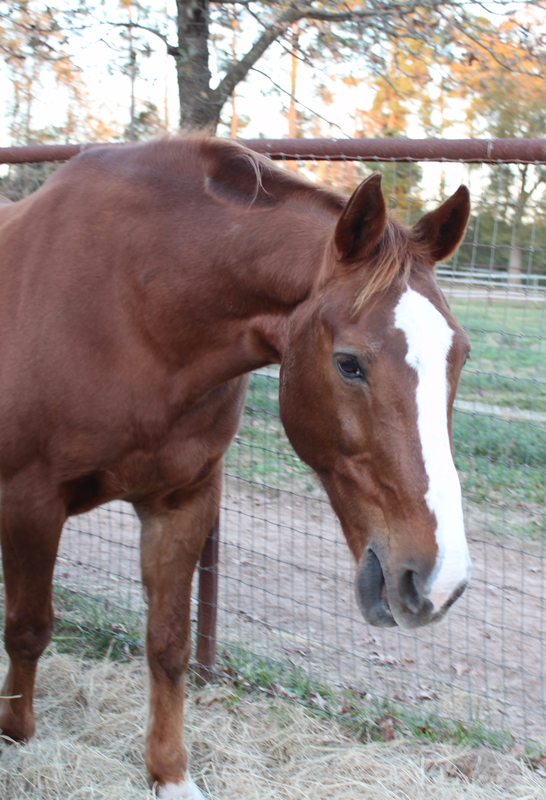 Shooter is a 1996 15.2 hand Quarter Horse who came to THF many years ago with a student of Kim’s. He was a ranch horse at the student’s grandfather’s ranch and they decided he could learn to jump. And did he ever learn to jump! He loves to jump and is a school horse that will teach you confidence. He is also very good on the trails. Shooter is easy to spot because he has a short tail. 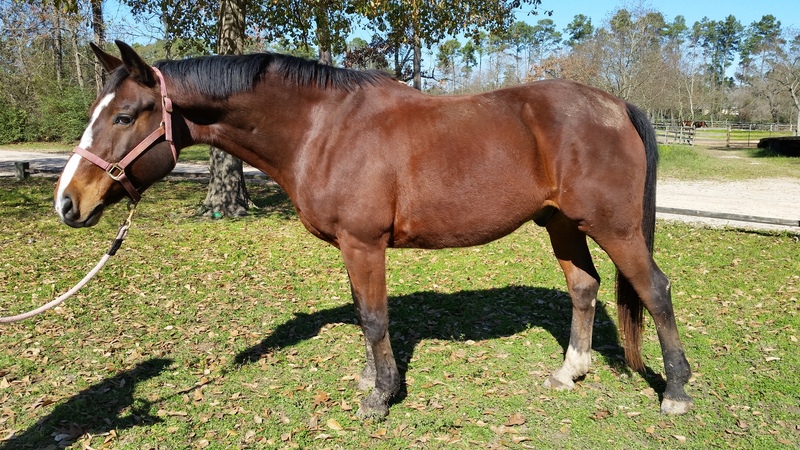 Sinbad is a 2004 paint quarter horse pony standing 14.1. He was a rescue horse that was treated for mange when he was younger. Once he was healthy Kim purchased him and began to work with him to become a school horse. He is a little quick and jumps great. He teaches students to use their seats and to work on the pony gallop. Sinbad is still not trusting around his head and you must earn his trust to put a bridle on him. We feel lucky to have given Sinbad a wonderful home. 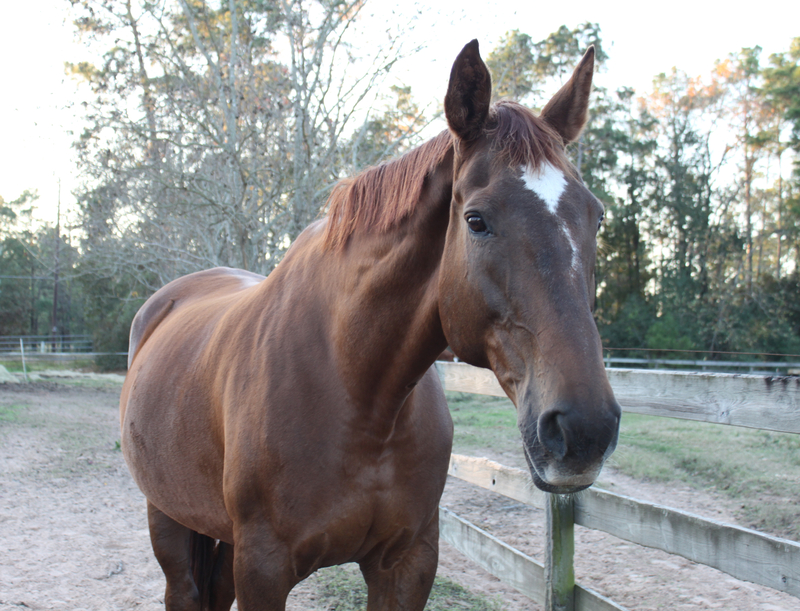 Sixes is a 1990 Chestnut Quarter horse and is 15.3 hands tall. She has been in Kim’s barn since 1996 and has belonged to several different students. In 2004, one of the students wanted to get a used car and Sixes was purchased as a school horse. She is a wonderful horse helping all her students to learn the basics. Sixes has won more ribbons than we can begin to count and taken many students on their first trip to school cross country. 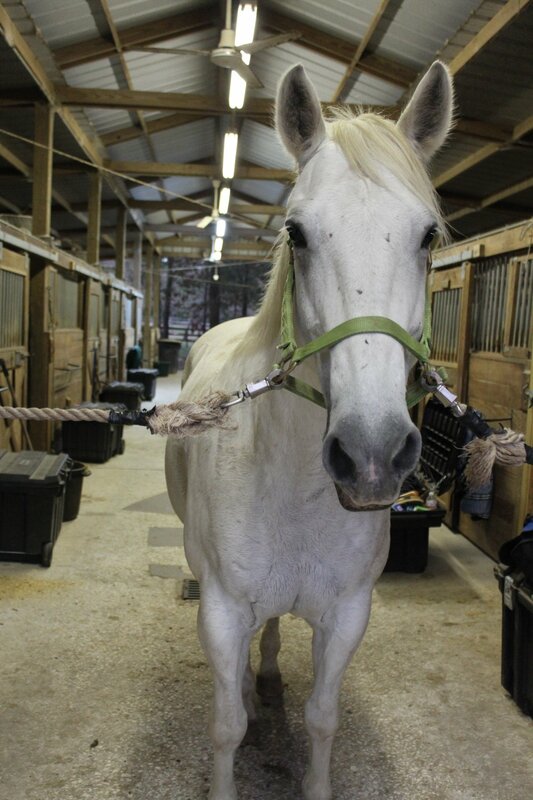 She is now helping students to learn to canter and jump their first cross-rails. Star was born at THF in 2000 and is a Cleveland Bay. She is one of the largest school horses standing 18.1 hands. She has always had a wonderful temperament and was schooled when she was very green by many of the advanced students. She started off showing in the hunter arena and then moved on to do jumpers going as high as 4’. She has been leased many times over the years and gives all the students the experience to ride something very big. Once you ride Star everything else seems like a pony. 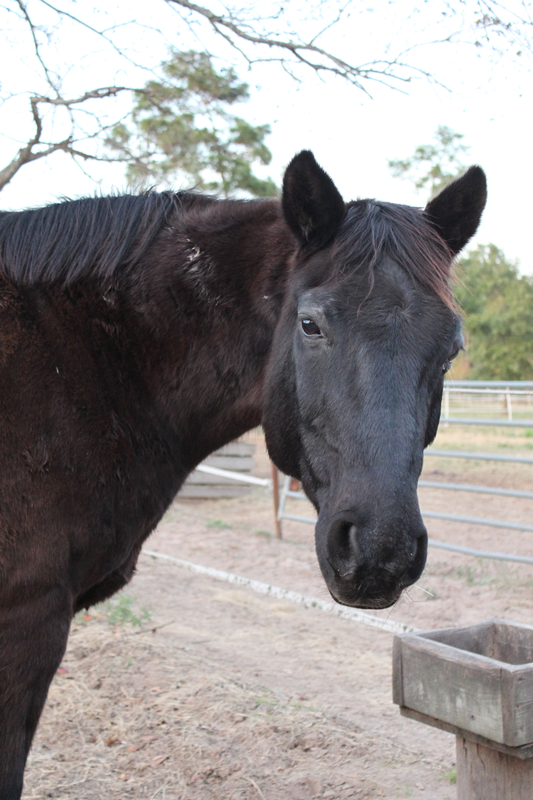 Stetson is a 1995 black Welsh gelding standing 15 Hands tall. He is a jumping machine and was at the barn when Kim and Dale purchased THF. He was owned by many students over the years and has taught them to ride and won many ribbons for them in the equitation classes and jumper classes. Kim purchased him in 2014 and he has been a wonderful addition to the school program. If you get to ride Stetson, you should be ready to have fun jumping. Surprise was born in 2001 at THF also and is the foal of one of our passed school horses Sadie. She too is a Cleveland Bay and is the half-sister to Star. We were hoping Surprise would be a pony but she has grown just like star and is now a horse, but she is only 14.3 hands. She is a beautiful mover and wins the hack at most shows. She also has a “10” jump but you will learn to keep your heels down to stay with her. She doesn’t care for the riders to pull on her mouth and is sometimes hard to catch but you will have fun riding her. At this time Tally Ho farm does not offer lesson horses available for lease. Our private boarders are sometimes looking for a leasor. Please talk with your instructor about which private horse might fit your needs.